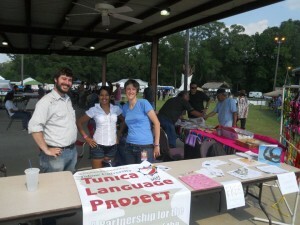 Members of the TLP team, pictured left to right: John Charles DePriest, Shayra Helena and Patricia Anderson. Since August of 2010, the Tunica-Biloxi Tribe of Marksville Louisiana has been working in collaboration with the Linguistics Department at Tulane University to revitalize the Tunica Language. The project began when Ms. Brenda Lintinger, Councilwoman of the Tunica-Biloxi Tribe of Louisiana, contacted Dr. Judith Maxwell, linguist and professor of anthropology at Tulane, with hopes that the University could assist the Tribe in reawakening the sleeping Tunica language after its sixty-year slumber. As a result of this communication, a team of linguists and linguistic students has been assembled to work with members of the tribe toward revitalization of the language. Members of the team enjoying a TLP-produced Tuncia children’s book. Using documents produced by Albert Gatschet, John Swanton and Mary Haas, the Tunica-Tulane Language Project has developed an updated, practical orthography for writing the language. The team has also written Tunica prayers, and produced several Tunica children’s books with accompanying recording in the language. Lesson plans have been created, and the Tunica-Biloxi Tribe held its first Tunica language camp in the summer of 2012. The Tulane-Tunica Working Group now hosts a Tumblr site and shares a Google Drive for collaborative work on materials in development. Current projects include producing an updated Tunica dictionary as well as an illustrated dictionary for children, creating a pedagogical grammar based on Haas, and producing digital, interactive language learning tools to accompany an ever increasing number of lesson plans.